Giant XTC 29"er: Sneak Peek! In our recent post on rumors from Frostbike, we heard that Giant was preparing some 29″er models for a 2010 release. Now the cat is out of the bag. Indeed, Giant is introducing a 29″er hardtail, at the least. The Giant produced sketches, which first appeared on their Facebook page, show a rendering of a hardtail frame with what appears would end up being all hydroformed tubing. The seat stay bridge appears to be a forged type piece. It appears that the seat tube may be slightly bent, ala Specialized’s 29″ers, as well. We can also see that the frame will have an integrated or semi-integrated head set and the 1 1/8″th to 1 1/2″ steer tube. We fully expect that the fork will be the new Marzocchi 44 model with the tapered steer tube, which is already in production. Also noteworthy is that Giant’s Facebook page indicates that there will be a single speed option as well. Giant typically doesn’t introduce new models until later in the summer, but we will keep our eyes peeled for anymore news on this or any other 29″er model being worked on by Giant. We had been hearing rumors that Motobecane would be introducing a new titanium 29″er model for some time now. It seems that now it has become a reality with Motobecane taking pre-orders on the bike now for a mid summer delivery. The bike, called the “Fly Team” features XTR, Avid, and FSA components with a Rock Shox fork set at 100mm of travel. The bike will be an astounding deal, retailing through the BikesDirect site for what many bare titanium frames sell for. BikesDirect is also rumored to be working on a full suspension 29″er, but no word on what the design might be, or when it may appear. Note: We are running this series on The Bike Lab as well. One of the classiest looking 29″er frame sets I have seen is the Singular Cycles Swift model. Unfortunately, since Singular is based in the U.K., you couldn’t grab one of these fine 4130 ChroMo sleds here in the U.S. of A. Now that’s all about to change as The Prairie Pedaler, a bicycle shop located in Prairie DuChein, Wisconsin, has signed on to become the exclusive dealer in the U.S.A. of Singular Cycles frame sets. Shop owner, Marty Larson tells us that build kits will also be available to set up any Singular Swift, Peregrine, Gryphon, or Hummingbird and have it shipped to your door as an option too. Marty expects frame and forks to arrive in late May. The prices for these frames have yet to be determined here, but we are told that they will be “very reasonable”. Each frame set will be supplied with a matching rigid fork, or a suspension fork can be substituted as an option. Each Singular frame is made with an eccentric bottom bracket and comes loaded with a shiny Phil Wood eccentric as well. Cable stops and derailleur hangars are there for your geared pleasure, if that’s the way you roll. 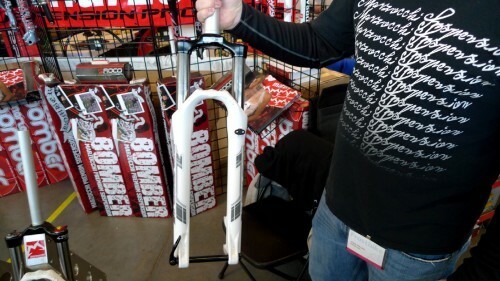 We are told that a very limited number of these frame sets will be hitting these shores in 2009. We just got our mits on a new Hutchinson Toro tire that was first shown at Sea Otter last year. Here’s what we found when we took a closer look at the Toro. The Toro is Hutchinson’s second 29″er tire effort. The Toro features Hutchinson’s Tubeless Ready Concept which utilizes a tubeless tire bead and sealant that the user installs to seal the casing instead of an extra layer of butyl rubber, like you find with UST tubeless tires. This results in lighter weight tires, and according to Hutchinson, a better ride, since the casings are more compliant. We have tested and used Hutchinson Python 29″er tires that utilize this casing and they have performed very well for us. We expect the Toro to be much the same in this regard. The Toro is one of the few 29″er tires to feature a casing treatment that toughens the hide of the tire against rocks, tears and punctures. The Toro does have a sidewall reinforcement called “Hardskin” From Hutchinson’s website– “Hardskin technology features a reinforced casing using a flexible and very dense textile grid. Placed on the sides, this reinforcement increases tire resistance or perforations and lateral cuts without reducing comfort or overall performance.” The Toro has a tread pattern that is more open and excells in lateral grip. The center knobs are designed for lower rolling resistance. The Hutchinson representatives I spoke with recommended the Toro as a front tire mated to a Python as a rear, so this is how we’ll be testing it. The “Hardskin” technology is a textile treatment that can be seen if you look closely at the tire. Our example weighed in at 690 grams and is supposed to measure out at a 2.1 inch width. We will be mounting it to a 28mm wide rim tubeless, so we will measure it up and report back with that in our First Impressions soon. The tire is now available and ready for thrashing from any bicycle dealer hooked up with the distributor Quality Bicycle Products. I just returned from attending Quality Bicycle Products “Frostbike”, which is a dealer open house/mini-trade show. Here are some tid bits and rumors I gleaned from the aisles of the show floor. Marzocchi 29 inch “44” model fork: I asked the Marzocchi rep about the upcoming 29″er fork that Niner spec’ed on their new W.F.O.9. Apparently, the 44 will be sold aftermarket towards the end of the summer/early fall. Expect it to be available with a straight steer tube in 1 1/8th” and with graphics similar to the prototype graphics above. 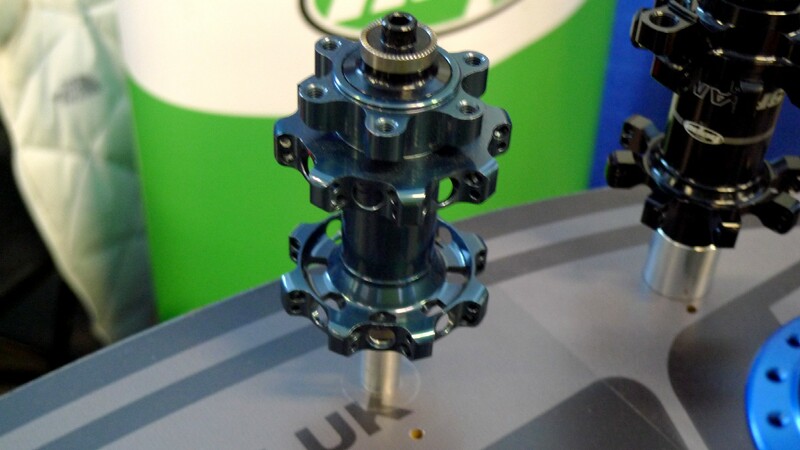 The forks will ship in 140mm travel configuration, but will be internally adjustable down to 100mm. Spacers to do the conversions will be supplied with each fork. The fork will have lock out, (no word on a remote) , rebound adjust, and will feature a titanium negative spring. The 44 will feature the new “15QR” through axle standard developed by Fox and Shimano. This fork is expected to be retailing at $799.99 or there abouts. Too rich for your budget? Then the second model 29″er fork from Marzocchi may trip your trigger. Yes, two models for 2010 will be available. The “33” will be essentially a 44 model with less expensive materials and a simpler damper. Travel will be identical to the 44. Price? We’re hearing around $450.00. Hope Complete 29″er Wheelset: Hope Technologies had some wild looking 3 bolt and 4 bolt disc brake standard hubs that featured straight pull spokes for 26″er wheels, but for 29″ers, they showed the gunmetal ano hub that they intend on making into a complete wheelset, prebuilt for sale. No word on pricing or weights as yet. We did hear that there were no plans to make it 20mm or 15mm through axle though. Edge Composites and Geax Working Together? : we’re hearing that there may be a collaboration between Edge Composites and Geax in the works regarding tubular 29 inch rims and tires. Geax is said to be in the initial prototyping stages of a Saguaro based tubular tire in 29 inch diameter. Edge has prototyped a rim, and it is said that the two companies may hook up on a project to bring these products to market. We’ll keep our eyes open for more as things develope. Speaking of Geax…: We’re told that a 29″er Gato tread tire in a “true 2.3” is on it’s way. The Gato is said to be a fast rolling, aggressive tire for various trail conditions. We’ll be keeping an eye out for more on this too. And more tire news: Continental tells us that the Race King will be in for most folks racing seasons, or in other words, about three weeks. The tire will be a “true 2.2” and will feature the unique tread pattern of the familiar 26″er Race King. Also, we’re told that a Rubber Queen 29″er variant is on the drawing boards. Finally, the long awaited Hutchinson Toro is now in stock and ready to ship out to bike shops. Twenty Nine Inches has one and will report on this tubeless ready knobby in the coming days. Hell Freezes Over? : In a stunner, we heard that Giant is finally going to offer 29″ers in 2010. Yes……..Giant! And not only that, but we’re hearing that they are jumping in with a suspension bike that will feature a tapered steer tube, as Niner started doing, (and we expect many others to do for 2010 models). No other word on model types, or whether or not we’ll see a full suspension model out of the box. Stay tuned for more on this as we learn it. Good news! Salsa Cycles Fargo bikes and frames are starting to be delivered. With that in mind, and due to all of the questions I get about off road drop bar set ups, I thought it would be a good time to post my thoughts on fitting a bike with drop bars with the purpose of off roading in mind. Keep in mind that there are not many ,(or any) other production off road drop bar specific rigs available, so this is new territory for most 29″er freaks. First of all, there are some things about drop bars for off road that need to be understood. Drop bars off road are not used like drop bars for road going bikes. Not at all! The positioning for your road biker is almost always “hood-centric’. Meaning that the primary position for riding is set up on how well the rider fits on the bike with his/her hands on the brake hoods. Not so with off road drop bar set up. In fact, the hoods are not even really a consideration here. When using drops for mountain biking, the primary posistion is based upon the hands being in the drops. Not on the hoods. So, is the drop bar a waste of time? Why use one if you can not use the hoods? This is a question born out modern day thinking in terms of drop bars. In the early 20th century, drop bar users never dreamed of riding primarily ‘on the hoods’. Especially since they really didn’t have any hoods! Just bare brake perches usually. These riders understood that dropbars were easier to use on rough tracks and aligned their wrists, forearms and shoulders in the most relaxed, comfortable way without giving anything away to control on a rough road. Drop bars for off road today reflect this same philosophy, but since most drop bar users are coming from today’s smooth tarmac type set ups, they have a hard time figuring this out. The tall stems, the odd frame angles. What is up with all of that? Actually, this is a great question, and worth looking into. Let’s take a look. In a comparison, the drop bars put your hands in a very similar place in space as they would be on the flat bar bike. Since the ideal off road position for drops is to be “in the drops” or “in the hooks”, the bars need to be positioned higher than they would need to be with a flat bar set up. There are two main design features that can be employed to achieve this. One way is to use a “sky scraper stem”. A stem with a ton of rise that gets the drop bars up to a height where the drops are usable off road. The other way is to utilize a severely sloping top tube/longer head tube. This automatically gets the handle bars set in a higher plane, and unusual stems are not necessary. Another variation on the top tube/head tube theme is to also use a very long fork. Here is an example of a long fork/tall head tube/severely sloping top tube design. It uses a standard Thomson 100mm stem. These designs get the drop section up to a height where it becomes useable all the time. Your saddle to bar height should be determined at the point where your hand grasps the drop section. I usually go with about three inches from the nose of the saddle to where my hands rest. Take a look at this photo to get an idea. The saddle to bar drop is determined at the point where your hands rest in the drops. Notice that the bar top is higher than my saddle is. This is normal for an offroad drop bar set up. The bar tops are rarely used while riding. In regards to the proper saddle to bar drop, this is a function of the stem at this point. In addition to spacers, you should be able to achieve a great riding position with “normal” stems. Especially with the Fargo. You can see how the longer head tube and sloping top tube work to allow you to achieve this. No goofy stems needed here! Another thing that you can notice here is that by the time I put my hands in the drops to ride, the centerline of the grip section ends up being right about the same distance as the stem clamp on the steer tube is from the stem’s handle bar clamp. In other words, no need to sweat your reach to the bars because of the drop bar thing. If I were to ride on the hoods all the time, then it would be a concern. But as I have shown, that isn’t what the off road drop bar set up is about anyway. Of course, if drops just don’t make sense to you off road, then none of this will either. That said, there are a couple of things to consider with off road drop bars. In the design of the Fargo, standover clearance is comprmised. If max standover is an issue, than the Fargo isn’t your rig. Also, the drop bars available that work well with off roading are not available in different widths. So if the width of an On One Midge, for example, doesn’t trip your trigger, then you are out of luck with that model. Choices in bars are limited. Finally, the shifting choices are limited as well due to the fact that drop bars do not accomodate mountain shifters. Some make do with road shifters or bar end shifters, but it is a limiting factor for some. In conclusion, fitting a Fargo is as much understanding drop bars for off road as anything. Once you get a handle on that part, fitting Salsa Cycles latest 29″er will be a snap. In my first post on this subject, I got some questions in the comments section that I wanted to address in this post, along with some other related topics having to do with front end geometry. It seems that this topic is very confusing to some, of great concern to others, and some could simply care less. To the latter I say, “Go on out for a ride.” This post won’t be of interest to you. To everybody else, I would suggest you all take a moment to read this short post about “trail as it relates to front end geometry. Once you have that down pat, we can look at head angles and where we are at with fork offsets. To better understand that, take a look at this article on offset. It will help clear up for you why more offset equals less trail/more unstable handling. Now with the advent of the longer offset forks for 29″ers, what does that do to those older 29″ers that had 38mm offset suspension forks on them? Well, for that I would direct you to my series that I did called An Experiment In Front End Geometry. Looking through those links there, you will begin to see that a pattern developes. One that I think is unique to big wheelers. That is the natural stability of the 29 inch wheel. It tends to overcome what would would result in an unrideable geometry for most folks in 26″ers. Done up in 29″er wheels, it is a different set of standards. The “window of what works” is a bit wider with the bigger wheels because of this “X-factor”, which is wheel stability caused by the gyroscopic tendencies in a 29″er wheel. So with more offset, we don’t see the instability with 29″er wheels that we might see with smaller wheel diameters. So how will that affect a bike that has a 72 degree head angle and a newer 46mm offset fork? (A question I see popping up alot lately) Well, it will be a bit different than it was with the old 38mm offset Reba, yes. A bit easier to steer, really. For many folks, a few rides in and they will never know the difference. For some, they will crave the older handling, and either stay with an older Reba, or get a bike with a slacker head tube angle, but in my opinion, these folks will be the exception rather than the rule. I just feel that the “stability factor” of 29 inch wheels will make the changes acceptable for most, and for many it will be an improvement. In an effort to be thorough here at “The Lab”, I am scouring for every bit of news on things going on here. The weather is starting to come around a bit, so we’re gearing up for more riding and testing at Twenty Nine Inches. More on Geax’s newest Saguaro tire versions. Saguaro TNT and UST Tires: We are starting to ride the Geax Saguaro TNT and Saguaro UST tires again in varied conditions. Look for an update coming soon. The UST version holds air really well without sealant, by the way. We’re really digging the Maxle Lite on the Reba team we’re testing. Rock Shox Reba Team 29″er with Maxle Lite: We’re really liking this fork so far. Everything the old Reba had that was good and none of the bad. Plus, the Maxle Lite is all that and a bag-o-chips. We’ll get to thrashing on this fork some more real soon and give ya’all a long term update on it’s performance. Future Arrivals: While I don’t like to give away everything on what’s going on in the future, I will say that Twenty Nine Inches has some pretty cool products lined up to get tested in the coming months. Besides the things I mentioned in the last post, we will have a bike hitting the Lab to test made out of that “magical gray metal”. Also, there should be another wheelset on test in the coming months. We are really excited about the potential for a test on a new FS rig and on a rigid fork that is pretty rad. Stay tuned for more this spring…….. News! : The rumored Shimano 12-36T cassette has been confirmed along with a hub to match. A hub? Yes…….a hub! It seems that Shimano is concious of the fact that a 36T cog will be generating a lot of torque, so there is a hub that will mate up with this cassette that reportedly has a beefier freehub body and ratcheting mechanism. Check out this thread on Mountain Bike Review for more on these items. Due to the snow covered trails in the Mid-West, reviews and tests have been on idle. Here are some things we’re in the middle of that we wanted to point out. Look for testing/reviewing to resume soon now that the weather is turning around and headed towards Spring. Salsa Fargo: We still are going to be doing some different things with the Salsa Cycles Fargo Right now the plan is to have some racks fitted to it and then later on the Fargo will be put to the test in “bike packing” mode. We will also be doing some gravel grinding on this rig to get a feel for the Fargo in a multi-hour ride situation. Milwaukee Bicycle Company 29″er: We will be returning to the Milwaukee Bicycle Company 29″er for some rides and then we will give you our final review and opinions on this nice steel single speed. Look for that update sometime in late March, if the weather cooperates. Edge Composites rims/American Classic hubs: While I finished up my end of the testing on these, and gave them a spot on my 2008 Top Ten List, we are not finished with them yet! Grannygear is thrashing these for our long term review in SoCal, so look for an update on these wheels coming your way this spring. Misfit Psycles Dissent: I’ll be getting the Dissent dirty soon hopeflly and will be back with our first update on this nice aluminum frame and fork. Also- Look for updates on Misfit Psycles “Cod Cog”, “FuBar”, and “Fu2Bar” over on The Bike Lab. Specialized Tires: We will also be finishing up our Mid-western leg of testing on the Specialized tires: The Eskar, The Captain, and the Fast Traks. Look for the wrap up on those to occur in late March/early April. Plus: Coming Attractions! : It looks to be a busy spring/summer at Twenty Nine Inches. Look for more tire tests, wheel reviews, and we have a couple more bicycles confirmed for testing and review that should show up yet this spring. We will have exclusive coverage of Salsa Cycles and Surly Bikes from Frostbike. We’ll be at Sea Otter in April looking for anything big wheel related, and we will always be here to bring you any news and rumors that pop up over the course of the next few months. Stay tuned to Twenty Nine Inches for more! You are currently browsing the The Big Wheeled Ballyhoo blog archives for February, 2009.